Apple’s much-anticipated iOS 7.1 update could come any day now, according to new information from John Gruber of Daring Fireball. 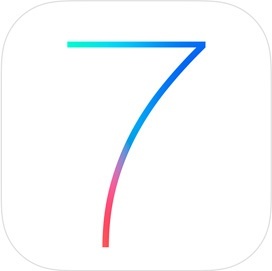 Gruber has heard that Apple has plans to release an iOS 7.1-reliant app that will stream the iTunes Festival performances at SXSW, and as SXSW will begin on March 11, iOS 7.1 will need to be released to the public ahead of that date. iOS 7.1 has been in testing since mid-November, and has seen five different developer betas thus far with the last beta coming on February 4. The operating system update includes a number of visual tweaks, including revamped shift and caps locks keys on the keyboard, refined icons for the Phone, FaceTime, and Messages apps, and a new look for several aspects of the Phone dialer. Details on features in past beta releases can be found in our previous beta posts: Beta 1,Beta 2, Beta 3, Beta 4 and Beta 5. A mid-March release date for iOS 7.1 is in line with several previous reports that havepointed to a March launch for the operating system. Apple has yet to seed a Golden Master build to developers, however. Coldplay, Imagine Dragons, and London Grammar kick off the SXSW iTunes Festival with a performance on March 11 that begins at 7:30 PM CST. A concept video of what a unified Control Center and multitasking interface would look like in iOS 8 has been created by designer Bill Labus and posted by TheTechBlock (via Cult of Mac). The version of iOS 8 in the video shows the app switcher and user settings in one unified view accessed by a single swipe up gesture. Users are free to multitask or toggle preferences such as music volume and WiFi, as the buttons for the toggles themselves have been combined into one space to allow for more room. The video also shows a refined Notification Center that features a minimalistic look with more centered text, which is triggered by a swipe gesture down. Unfortunately, I find double-clicking the home button to be irritating- there’s a noticeable delay between the second click and the multitasking view appearing, and in my haste I often accidentally triple-click the home button, forcing me to wait while the OS bounces into, and back out of, multitasking. Control Center’s bottom edge gesture is far faster and easier to perform, however as I said I do use Control Center frequently as well, so I wouldn’t necessarily want to swap the two and use the home button double click to bring up Control Center. 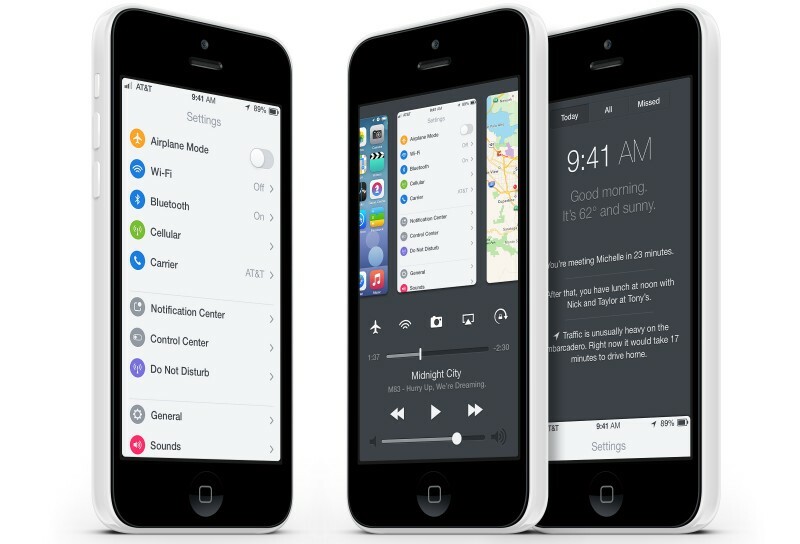 Apple introduced Control Center and a refined version of multitasking with the release of iOS 7 last fall. While an overhaul or unification of both is unlikely to happen with any immediate update to iOS 7, it is possible that Apple could make major changes in time for iOS 8, which will likely be released this fall. 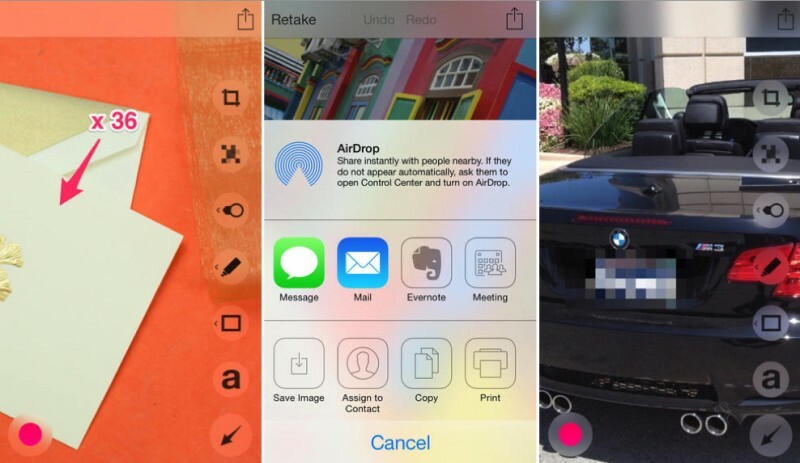 Evernote has updated its Skitch marking and annotation app for iOS, with the new version notably only compatible with devices running iOS 7. The app contains new features such the ability to send marked up snapshots via AirDrop as well as email or SMS, new gesture-based features to quickly take, mark, and send photos, additional annotation symbols with full freehand pencil annotations, and the ability to display annotations on larger screens with AirPlay. Redesigned to take advantage of iOS 7 features. Skitch lets you communicate important ideas in an instant. Snap a photo, mark it up, and send it on. Make your message clear with arrows, stamps, text, shapes, and more. Getting your point across has never been easier. Acquired by Evernote in 2011, Skitch is a part of the Evernote suite of apps and also features full integration with the popular note-taking app. Skitch is a free download for the iPhone and iPad and is available on the App Store.